AMOR believes that one of the best ways to bring about positive, profound, and permanent change in Guatemala is to support indigenous women/human rights defenders and their vital work, with a particular emphasis on those vulnerable groups and individuals operating outside of the international human rights network. ​​This project was inspired by the experiences of some AMOR members who suffered persecution as a result of their indigenous human rights defence work. Despite the many human rights organisations claiming to offer support, (some of which do great work), the defenders were unable to obtain the support they needed to be safe and rebuild their work and lives. Existing support is scarce, oversubscribed and extremely competitive. Smaller rurally located defenders cannot compete and are unlikely to obtain support. Most existing support focuses on supporting high-profile or "celebrity" human rights defenders already receiving attention. Unknown groups without connections are largely deemed ineligible for support. Little support exists for human rights defenders in exile who wish to return to their home country. Some support programmes lack transparency and even discriminate against defenders. For example, one of our members was assessed for support by one of the largest organisations over a period of months and a substantial amount of application paperwork. At the end of this, the defender was rejected without reason. After investigations, it was revealed that they had received a negative reference from an in-country partner organisation based on inaccurate information. Despite receiving evidence of these inaccuracies, the organisation in question refused to remedy the situation. As this was the only programme for defenders in exile, this left the defender in a very dangerous position. There are very few organisation offering a comprehensive support package for defenders. Obtaining support in-country can mean travel costs out of reach of defenders under attack. The support response can be extremely slow, in particular in the case of legal support. One of our defenders was told it would take the legal team a month to analyse her case. Meanwhile, every passing day she was in peril and danger of arbitrary arrest. This can best be achieved when the defenders themselves define the type of accompaniment, advocacy, and solidarity that best meets their needs. 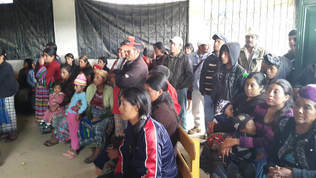 ​To meet these needs and address these shortfalls, AMOR provides protection, support and access to justice and wider support for local indigenous K’iche’ Mayan (W)HRDs working in communities unconnected to or unresourced by the wider human rights community. · Building bridges between local groups and the wider human rights defence community both nationally and internationally so that no-one is left without adequate protection.